The city of Marietta's Fourth in the Park celebration begins Thursday, July 4, 2019 at 10 a.m. and includes a parade, free live concerts, museum tours, arts and crafts show, food, carnival games and fireworks finale. The Marietta Freedom Parade includes 110 entries, 2,000 participants and an estimated 30,000 spectators. The parade begins at 10 a.m. at Roswell Street Baptist Church and travels west on Roswell Street, north on East Park Square past Glover Park and the Square, down Cherokee Street and ends at North Marietta Parkway. 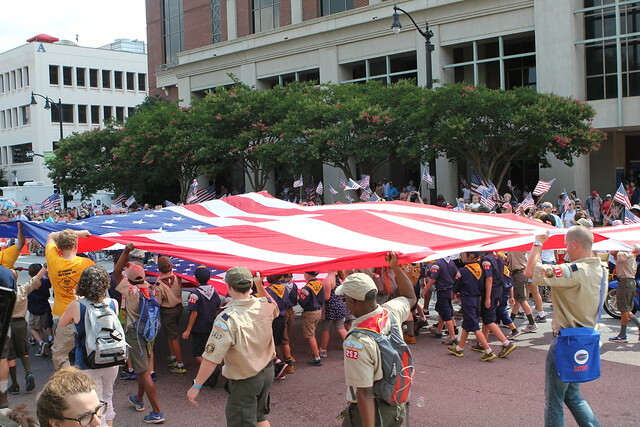 Entries include marching units from the city of Marietta, civic organizations, beauty queens, scouts and local businesses. Application to participate in the parade can be found HERE. Application deadline is May 31, 2019 5:00pm. The end of the parade marks the start of the Festival. Food concessions, arts and crafts and carnival will provide plenty to do for the whole family. The Fourth in the Park celebration is coupled with a large arts and crafts show that continues all day. For more information or to apply to be a vendor, visit the JRM Management website. For more information, call Marietta Parks and Recreation at 770-794-5601.